About 17 percent of children and adolescents ages 2 to 19 years are obese, reported the Journal of the American Medical Association in 2014. An 11-year-old that falls into this category is at an increased risk of health problems -- such as high blood pressure and type 2 diabetes -- which are usually reserved for older, overweight adults. Overweight children also are also more likely to be overweight in adulthood. Putting a child on a "diet" can be unhealthy, though, as it may lead to nutritional deficiencies and a distorted relationship with food. Instead, help an 11-year-old crowd out unhealthy, high-calorie food choices by offering more vegetables, fruits, low-fat dairy and lean protein. Also encourage physical activity every day to help him burn calories and achieve a healthier weight. These small changes can help a child feel healthier and more energetic quickly, but losing weight will take time. 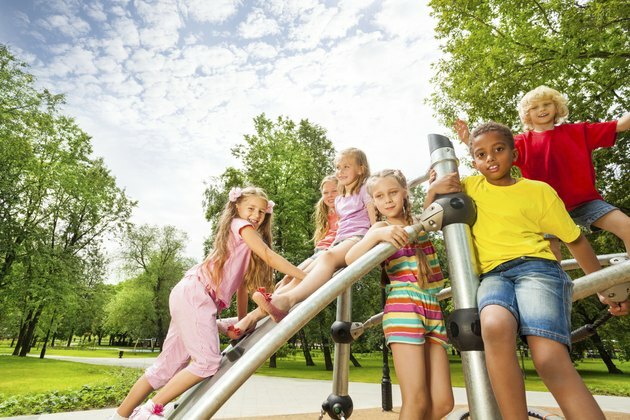 The Centers for Disease Control and Prevention recommend children, including 11-year-olds, get at least an hour of physical exercise daily. More movement helps a kid use more calories and burn off body fat for energy. This physical activity can consist of moderate-intensity and vigorous-intensity cardio as well as bone- and muscle-strengthening activities. Walking the dog or cycling to a friend's house is considered moderate-intensity, while chasing a friend during a game of tag is of vigorous intensity. An 11-year-old can easily incorporate muscle-strengthening exercise by playing on the playground, performing gymnastics or climbing a tree. Fun activities such as jumping rope or playing basketball help strengthen kids' bones. Limiting screen time -- whether it's television, computer or video games -- to no longer than 2 hours per day helps encourage kids to get moving. Include your 11-year-old in family activities, such as a weekend hike or after-dinner stroll. Give your child ideas of ways to be active outside of P.E. class or sports practice, such as dancing to music, skateboarding or riding a bike. Making wise food choices helps kids, and adults, reach healthy weights. Lean proteins, such as grilled chicken breast, lean ground beef and low-fat cottage cheese, should feature prominently at meals. Skip fried foods or items covered in high-calorie cheese. Opt for fresh fruits and vegetables, low-fat dairy and whole grains as side dishes. Avoid creamy sauces and dressings and go for salsa, olive oil, herbs and lemon juice to provide flavor instead. Choose healthy items, such as low-fat cheese sticks, fresh fruit or low-fat yogurt as snacks. To lose weight a little faster, limit intake of foods that lead to weight gain. Fast food, full-fat dairy, fried foods, packaged snacks, sugary treats, white bread and soda don't contribute many nutrients, but they do provide numerous calories. When a child is hungry for a second helping or needs something between meals, offer fruit, more vegetables, such as salad greens or carrot sticks, or a second piece of lean protein. Keep tempting sweets and processed snacks out of the house. When the family grocery shops, stick to the perimeter of the store to load up on fruits, veggies, lean proteins and low-fat dairy. Avoid the bakery and the aisles containing the processed, high-calorie snacks. Include your 11-year-old in the shopping process and make healthy choices according to his tastes. An 11-year-old seeking to lose weight can pack his own lunch so he's assured of having healthy options. Or go over the school lunch menu with him ahead of time and help him learn which items are more nutritious choices. When he attends a school party, contribute a kid-friendly snack -- such as grapes or baby carrots with dip -- so he has alternatives to the sugary treats and junk foods. The more often an 11-year-old can avoid high-calorie, low-nutrient foods, the faster he can achieve a healthy size. Fad diets and skipping meals may seem like an easy way to lose weight. But, these strategies cause an 11-year-old to miss out on nutrients that are critical for growth and development, brain function and energy. Help a child learn to eat all foods in moderation. It's OK to have a slice of birthday cake once in a while -- but make healthy choices most of the time. Set a good example by modeling these behaviors. Try to become aware of the feelings your child attaches to food. Notice if your 11-year-old reaches for a snack when bored or stressed, and if so, help him seek out an alternative support strategy. Parents can help a child create healthful coping mechanisms that aren't based on food. Such strategies include calling a friend, writing in a journal or going for a walk. Centers for Disease Control and Prevention: Aerobic, Muscle- and Bone-Strengthening: What Counts?